Half of the people who were listed among the Fylde coast’s most wanted last year are still on the run from the law, The Gazette can reveal. These five suspects are still being hunted by police – more than two months since a public appeal to help track them down. But three more were hauled before the courts after their faces appeared on the front page of The Gazette on Boxing Day. The other two people who featured in the appeal over the festive period were arrested but released without charge. Now police are making a fresh plea for information on the whereabouts of the five outstanding suspects. Joseph Gregory, of Empress Drive, North Shore, is wanted for an aggravated burglary that took place in Poulton. 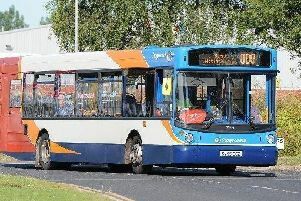 The 23-year-old is known to visit the Poulton and Fleetwood areas regularly. Shelli Walsh – who also goes under the name Shelli Priestly – is wanted for burglary and assaulting an elderly woman. The 53-year-old, whose last known address was on Ashton Road, has been on the run since the offences in Blackpool town centre, which date back to 2013. Colin Keith Falck, 67, of no fixed address, made the list because he is wanted for harassing a former partner. Stuart Hilton, 41, whose last known address was on Coop Street, is wanted for shoplifting in the town centre. He is also known to frequent South Shore. Phillip Jones, 24, known to have lived on Crossland Road, Hawes Side, has been linked to a theft from a motor vehicle in South Shore, where he is still known to visit. Three men who appeared in The Gazette have been charged with various offences. A 31-year-old was arrested on February 8 and later charged with false imprisonment and assault. He and another defendant appeared in court last month. An 18-year-old was arrested on New Year’s Eve – just days after the appeal – and charged with assault. He is to face trial at Blackpool Magistrates’ Court on March 30. And a 44-year-old, of central Blackpool was arrested on January 19 and charged with being drunk and disorderly in a public place. Two other wanted men were arrested, but not charged.